Accompanying last year’s DC Comics fighting game of the same name, the Injustice: Gods Among Us comic laid the groundwork for the game’s story, serving as a prequel to the events seen in the game. After the great reaction the series received, it’s been announced that writer Tom Taylor would be bringing another year of Injustice comics with Injustice: Year Two, naturally. In the first series, we saw Superman’s decent into darkness, which ultimately culminates in the form of the final battle of the game, but Injustice: Year Two will give readers a bit more of how Supes’ war on crime affects the rest of the DC Universe, including ****SPOILERS**** the reaction of his fellow heroes to the death of the Green Arrow at the end of the last chapter in the comics. Even though we know what it eventually leads to, Taylor assures us that there’s much more worth covering. I want to know what happens with a vengeful Black Canary. I want to know how Green Lantern falls. I want to know what happens to Harley Quinn with the Joker no longer in the picture. I want to know why Superman teams up with supervillains. I want to see Batman heal. I want to find out who lives and who dies, and how. I want to see powerful beings, who were once allies, fighting each other with the future of the universe at stake. Despite the death of one of his best friends, Green Lantern Hal Jordan still believes in what Superman is doing. For Black Canary, losing her love at the hands of Superman has firmly turned her against the Man of Steel, and others are only too happy to help her against him. The thing I enjoyed most about the Injustice game was that, in the story mode, heroes and villains took sides that were a bit surprising, to say the least, but I can imagine just how fun it will be to see them get to that point in their stories. The story expansion won’t stop there, though. According to Taylor, other worlds and races will take notice of the superhero civil war taking place, and they might be popping their heads in on the battle, but that won’t take away from what made Injustice: Gods Among Us so successful in the first place. This is no longer just about Earth. Superman’s actions are not just raising concerns for the leaders of our world. Powerful beings across the stars are turning their gaze towards Earth. [But] don’t worry, you can still expect more fractured relationships, loss and pain for the characters you love. Honestly, I didn’t even realize that there was an entire comic series based around the game until I heard that there would be a second series of it, but it definitely sounds like it’ll be worth checking out, if only to see Black Canary take her anger out on Superman and his allies. 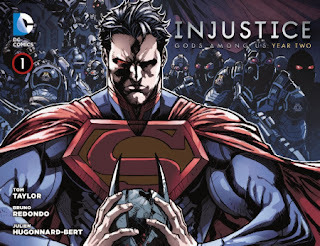 Has anyone else read the Injustice: Gods Among Us series yet, and will you be checking out Year Two on January 15? Let us know!